(March 3, 1944) - In a telegram received Wednesday from Lt. General A. A. Vandergriff of the U.S. Marine Corps, Mr. and Mrs. Cyrus W. Dunthorn of High Street were informed of the death in action of their son, Pfc. Cecil Bruce Dunthorn, 22, of the celebrated Fifth Marines. Two days before they had received a letter from Pfc. Jon La Barbera, one of Bruce's buddies telling them of their son's death while on a mission early in February during the invasion of Cape Gloucester, New Guinea. 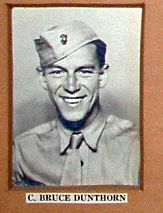 Lt. Gen. Vandergriff's wire stated that Bruce was "killed in action in the performance of duty and service of his country." Pfc. La Barbera wrote: "Before he passed away, Bruce asked me to write home for him. I have known Bruce for two years and we've been through thick and thin. When we lost Bruce, we lost the squad. He was undoubtedly the best. Two boys attempted to bring him to safety but did not succeed. One of the boys was wounded, the other was not hurt." When he returned he would be able to tell the story in detail. Mr. and Mrs. Dunthorn last heard from their son in a letter written Jan. 24, in which he had asked that some toothpaste be sent to him. Earlier, in reply to a letter from his parents in which they had asked what he would like to have for Christmas, he had written that he wanted "only a handful of snow." Pfc. Dunthorn, who was a sniper scout, had also taken part in most of the battle of Guadalcanal. He had been left behind in New Caledonia because of a broken wrist, but a few days later managed to stow away on a bomber and joined his unit at Guadalcanal. He entered into the Marines the day after Pearl Harbor, and trained at Parris Island, S.C., and New River, N.C. His unit left New River in May 1942 for New Zealand where they went through an earthquake a day or two after arrival. After Guadalcanal, Pfc. Dunthorn was evacuated to Brisbane, Australia, going from there to a town near Melbourne for a short rest. He later went to New Guinea for several months duty there. On Feb. 4, Mr. and Mrs. Dunthorn had received word that their son had been recommended for the Navy V-12 training program in this country. He is a graduate of Nutley high school. A brother, Lt. Cyrus Dunthorn Jr., 25, is serving with an ordnance ammunition company in the Aleutians. He was graduated from Nutley high school and won a scholarship to Stevens Institute of Technology in Hoboken. He later attended Rutgers university. Another brother, Gunners Mate s/c Byron Dunthorn, is in the Navy armed guard and is captain of a gun crew on a merchant ship. When he last wrote to his family, he was in Scotland. 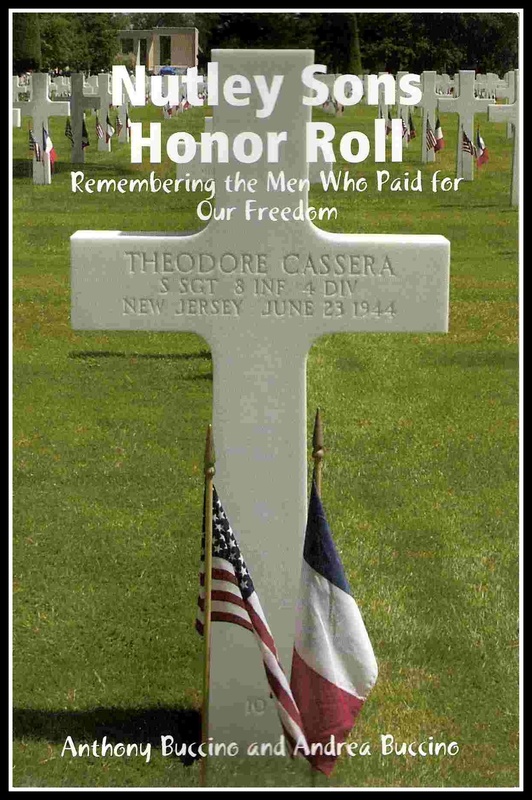 He is also a graduate of Nutley high school and enlisted on Navy Day. Friend Writes "A Marine Never Dies"
(March 10, 1944) - As plans were being made this week by Mr. and Mrs. Cyrus W. Dunthorn for a memorial service for their son Pfc. C. Bruce Dunthorn, of the Fifth Marines, killed in action January 15 at Cape Gloucester, New Britain, word came from two of their son's commanding officers telling of the circumstances of his death. They had received official word of his death last week in a telegram from Lt. Gen. A.A. Vandergriff of the U.S. Marine Corps. The memorial service will be held Sunday afternoon at 2:30 o'clock at Grace Episcopal Church. The rector Rev. L. Harold Henrichs will officiate. It has been requested that no flowers be sent. Both Capt. John W. Holland and 1st Lt. P.W. Vaught of the Fifth Marines spoke of the young marine's courage and his sense of duty in their letters to Mr. and Mrs. Dunthorn. Capt. Holland wrote: "As Bruce's commanding officer, I always found him not only ready and willing to do his own tasks but also eager to go out of his way to help on odd jobs. It was the same spirit of unselfishness that brought him to his untimely death. "A letter from Lt. Vaught, Bruce's platoon leader, accompanies this note of mine and gives some of the circumstances you may wish to know. However, he failed to say that Bruce volunteered to carry the important message back to us. I can only re-emphasize that Bruce's bravery and sense of duty will not be forgotten. You may rest assured that Bruce was laid to rest with full religious rites and ceremonies in a cemetery which houses other buddies of ours who have passed on." Lt. Vaught wrote that he had known Bruce for a year and saw in him a young man of high intelligence, common sense, versatility and ambition - a young man with great possibilities. "The work he had done while in combat this time," he went on to say, "had been in keeping with his character. The day, January 25, that he met .... <<Copy missing>> .... duty has not gone unnoticed and shall never be forgotten. Such men, as he are those we call the unsung heroes." "When he stowed away on that plane to go to Guadalcanal he was admired by everyone who had heard of it, especially the men in my company. We in the Marine Corps don't like to say that he was killed. We like to think that he has taken a long furlough. A Marine never dies." KILLED IN ACTION AT BOUGAINVILLE, SOUTH PACIFIC ON 1/25/44. PELELIU CAMPAIGN, CAPE GLOUCESTER, NEW BRITAIN. Copyright, 1947 by William Sloane Associates, Inc. Second Printing. The story about Bruce Dunthorn is under the section called THE MEN and is called INCIDENT AT NATAMO by Second Lieutenant Gerald A. Waindel, on Pages 173-177.